(¸.·´Keep the kids busy this Thanksgiving with this Thanksgiving Activity Themed Placemats with Crayon Boxes. 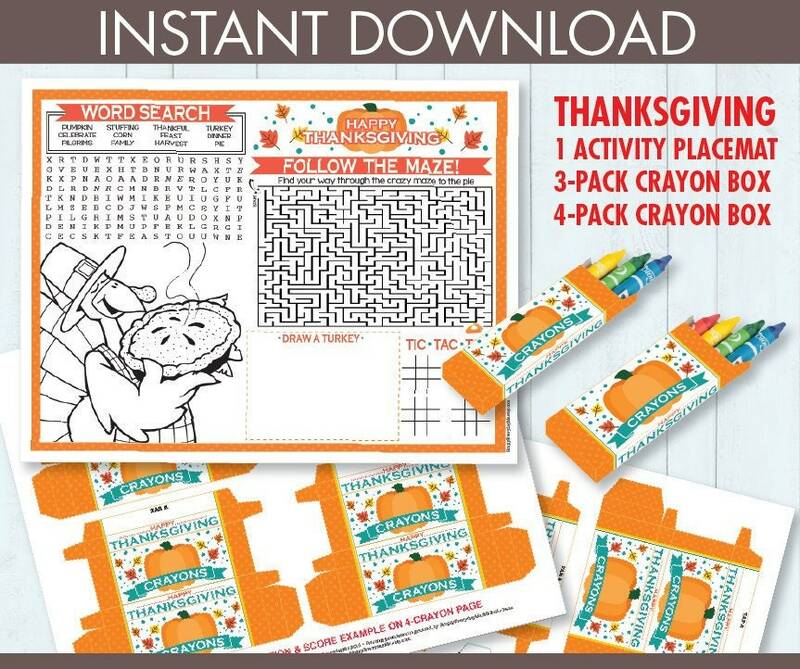 These are a DIY Printable Item and includes: ★ ONE Activity Placemat on 8.5"x11" which has a Thanksgiving Word Search, Thanksgiving Coloring Image, a fun Crazy Maze, Drawing Area & Tic Tac Toe ★ Word Search Answers are included ★ Crayon Boxes - 4-pack Crayon Box (2 on a page) - AND - a 3-pack Crayon Box (4 on a page) ★ This set also includes an information PDF for materials needed & paper suggestions. Your Thanksgiving Party will be complete with these fun Thanksgiving Activity Placemats & Crayon boxes... They're a fun addition to keep the kiddos busy.